The top two I made last year. The bottom four I made this year. Love all the cool things you do for your students, Sam! You keep those relationships upbeat and focused on making math cool. Did you make up those lines yourself? They’re so creative. Love it! Remind me what site you used to create/order these? 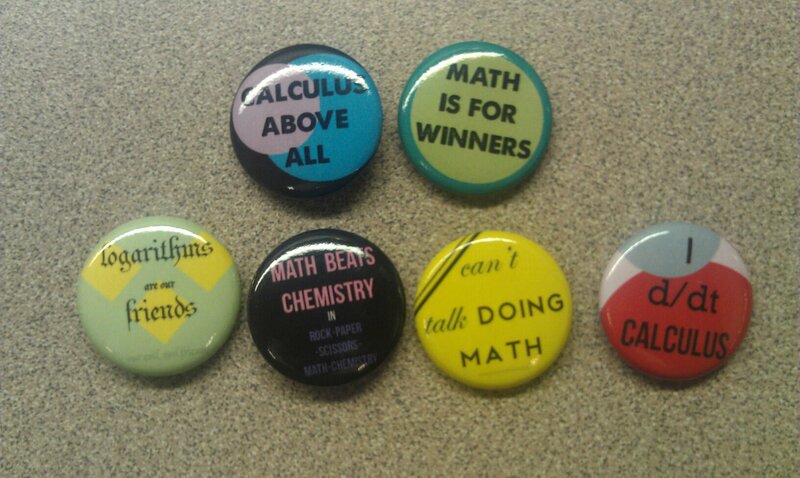 What does the bottom of the “Math beats Chemistry” button say? You have a great site with lots of useful links and ideas. I’m an AP Calculus and Stats teacher in southern China and would love to start a dialogue with you offline, but couldn’t find your email address anywhere. If you get a chance, please drop me a line. Great site, Sam! I’m going to you in my blogroll on my site. Would you please consider adding me to your blogroll as well? My site is Math Concepts Explained at http://sk19math.blogspot.com. Thanks!